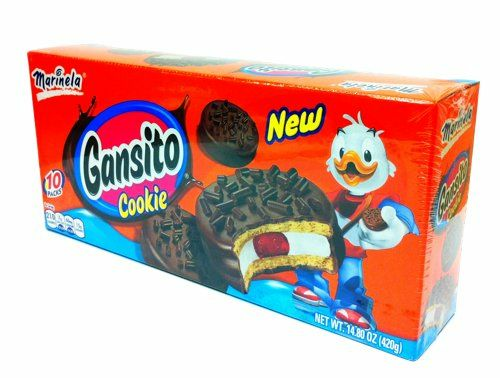 Gansito Cookie is a wonderfully sweet confection that brings the traditionalflavor of the beloved Gansito snack cakes into one scrumptiouscookie. Its a delicious sandwiche creme cookie with a strawberryfilling, that is coated in succulent chocolate and sprinkles. Its afavorite for generations, make it yours too and savour the flavor ofGansito. Cookie with strawberry & creme filling, coated in chocolate and sprinkles. Great snack on the go, surprise your little ones and add thissweet treat to their lunch boxes. Enjoy with an ice cold glass of plainor chocolatemilk. Calories: 210, Sodium: 60 mg, Sugars: 15g, Sat fat: 7g. NET WT: 14.80 oz. (420 g). La Galleta Gansito es una dulce confeccion que combina el tradicionalsabor de los populares pastelitos pero ahora en una deliciosagalleta. Es una sabrosisima galleta cremosa con un relleno sabor afresa, cubierto completamente de chocolate y chispitas. A sido unfavorito de todas las generaciones y tambien puede ser tuyo, noesperes mas y disfruta de su sabor unico. Como dice el famoso slogande Gansito...Recuerdame! Galletas con relleno cremosito y con sabor a fresa, cubiertas con chocolate ychispitas. Un botana perfecta para disfrutar en cualquier parte. Sorprende atus peque�os con esta dulce golosina en sus loncheras. Disfrutalas con un vaso de leche oleche conchocolate. Calorias: 210, Sodio: 60 mg, Azucares: 15 g, Grasa Trans: 7 g.
Peso Neto: 14.80 oz. (420 g). I truly enjoy the combination of these cookies. The combo of cookies with Marshmallow, and Kelly covered in chocolate is great. The cookies taste great and taste really good and also are what it shows here.